Form and colour variants. Matt lacquered Lichen Green for the doors and melaminic Zolfino Larch for the open-shelf wall-hung elements. 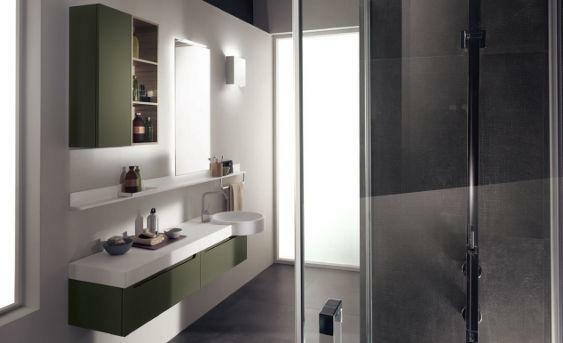 The top, with integrated “Omega” washbasin positioned at the end of the composition, is made of Cristalplant. Prestigious design and excellent solutions characterise these shower enclosures (easy to install in any space, thanks to the variety of models and sizes) and the range of bathroom fixtures, which blend in harmoniously with the project. Graced by unprecedented washbasins and elegant tops, these modules are complemented by fixtures and accessories of innovative design. Among these, the minimal wall-hung accessory rail “Skyline”. © 2014 Skyline Services (North West) LLP.